Last night at Little League, I had one of those moments of clarity that come every so often when things are quiet. And after a little more thought last night, I realized it’s time to take a stand. I’ve been so frustrated lately with all of the excuses – why teeth aren’t brushed…homework isn’t done…things aren’t put away…why attitudes are bad…the forgetfulness that’s really just laziness…and so many words that are unkind. It seems like I hear a hundred different excuses a day. to the point that I ended up yelling “shut up” in the car yesterday on the way to a doctor’s appointment. We’ve allowed some really bad habits to develop. But those are just more excuses. We’re less than four weeks away from summer vacation – something I’ve been looking forward to – and I’m realizing if we don’t tighten up the reigns a bit, it’s going to a long, miserable summer. I don’t want a summer of XBOX 360 and tv non-stop, of complaining and laziness, of arguing and blaming. I’m realizing that for any change to be permanent in a family, it has to start with mom and dad. Because I am the queen of excuses – the kids come by their propensity for them naturally. I didn’t exercise this morning because I didn’t sleep well…I didn’t sleep well because I didn’t eat well…I didn’t eat well because I was tired and stressed…I was tired and stressed because I didn’t eat well or exercise. It’s an ugly circle that doesn’t do anyone any good. Tom spoke on Jonah this past Sunday in church, and I was particularly struck by two things – God’s command to Jonah to just go and the fact that Jonah was down in the ship sleeping while it was sinking. It’s time to wake up, and it’s time to go. Time to make changes and to hold myself – and my family- to a higher standard. I’m not sure exactly how to do it, beyond starting with prayer. 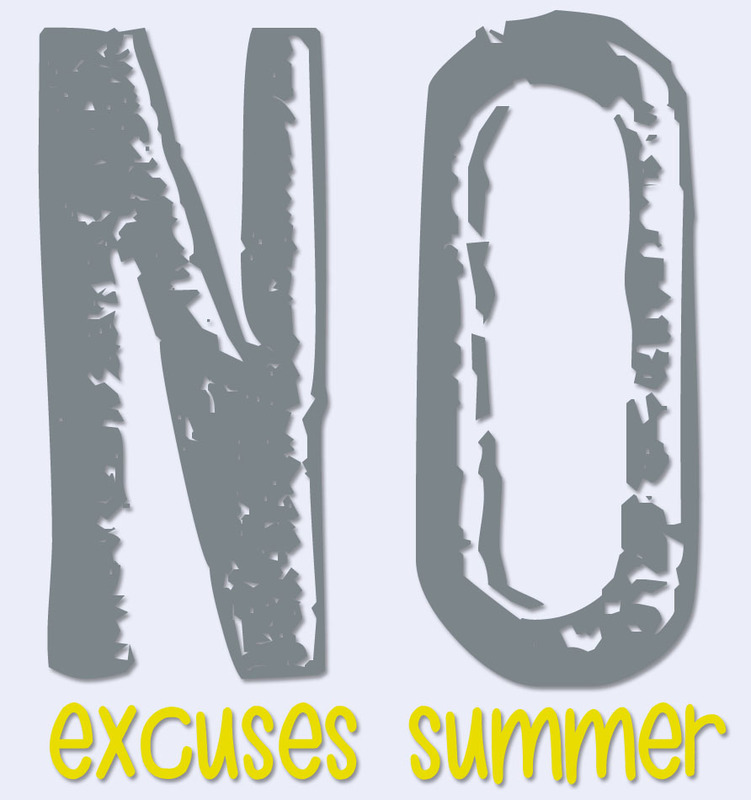 I’ll share more, and if you want to join with us in the No Excuses Summer, please share. I’m hoping to have some definite goals up next week if you want to join in. This entry was posted in Simply Family, Simply Intentional and tagged family, healthy-living, no excuses, summer by Awkward Girl Gets Fit. Bookmark the permalink. I know you can’t see me from all the way across the country but I am waving my arms, jumping up and down, and hollering a great big hearty AMEN!! I’m not sure exactly what it will look like but I’m tired of it too and I will sign on any dotted line to figure it out with you… Going back to school has been tough to work around, even though I know in the long run, this will have a huge payoff and it’s where I am meant to be right now, even in spite of my Dad’s illness. As frustrating as it is, it’s gratifying to know that I must not be a terrible parent, if one of the moms I look up to most is struggling with this too… Here’s to what it looks like and to taking first steps 🙂 Love you, Sam! I’m working on a post I’ll put up next week with a little more focus. I have to confess – as I’m looking at going back to school, I hear myself saying a lot of “if Nicole can do it with all those kids, I can too!”. You’re my inspiration! Can I come live in your house? This sounds like a program I’m totally on board with. Yes! I have a feeling I’m going to need some support.